Oluwatoyosi Ogunseye, a Mandela Washington Fellow, will receive the Presidential Precinct’s Inaugural Young Leader Award in Charlottesville, VA on March 29. March 28, 2016 —In partnership with the Presidential Precinct, the State Department is sponsoring the Global Leadership Forum in Charlottesville, Virginia from March 29-30, 2016. Assistant Secretary Evan Ryan and University of Virginia President Teresa Sullivan open the forum. The two-day forum is part of the Bureau of Educational and Cultural Affairs’ celebration of 75 years of State Department-sponsored exchange programs. The Global Leadership Forum convenes emerging and established leaders from more than 25 countries to explore some of the world’s most pressing challenges. The Forum brings together current State Department-sponsored international exchange participants and alumni, faculty and students from the University of Virginia and the College of William & Mary, and representatives from civil society and the private sector for a robust discussion about global leadership challenges and opportunities in the 21st century. The forum allows participants to gain international insight, develop new leadership skills, and further build a global network through the exchange of ideas and best practices. Follow the conversation on social media with #GLF2016. Additionally, at an awards dinner on March 29, the first female editor of Nigeria’s Punch newspaper, Oluwatoyosi Ogunseye, will be presented with the Presidential Precinct’s inaugural Young Leader Award. 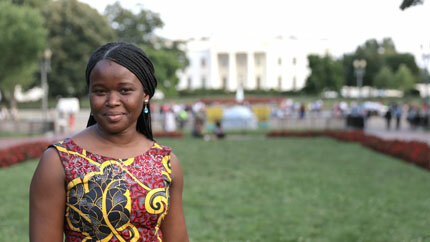 Ogunseye first came to Virginia as a member of the inaugural 2014 class of the Mandela Washington Fellowship. She was one of 500 emerging leaders selected from over 50,000 applications to participate in the program, which is the flagship effort of the Young African Leaders Initiative (YALI). She will be recognized along with former Secretary of State Madeleine Albright, who will receive the University of Virginia’s Inaugural Edward R. Stettinius Jr. Prize for Global Leadership.